Hurricane Alex hit NW Mexico on July 1 and was followed by a tropical storm. Lakes filled and many thousands of people lost homes and all their personal property from the storms and flooding along the Rio Grande River from Piedras Negras to Matamoros. By mid-July rural communities in the Valle Hermoso-Matamoros area of Mexico were under water. Houses were flooded in Western Hidalgo County, Texas, as well. Agricultural losses were significant. CUPS helped families from flooded communities with used clothing and toiletries donated by volunteers and supporters. Drug-related violence slowed briefly during the flooding but resurged as cartels resumed targeted violence against opponent cartels and those policing the drug trade. Valle Hermoso has suffered from this violence through this year. Please continue to pray for the safety of our friends in Mexico and the communities that are part of the life and history of CUPS. The new CUPS office address in McAllen is 4305 North 10th Street, J5, McAllen, TX 78501. CUPS faced a very challenging year in 2010 but despite the conditions in Mexico, with God's strength we were still able to accomplish many needed projects. Here are some of the highlights from 2010. "...in the name of our teachers and my fellow students,....it is my great pleasure to thank Comunidades Unidas Pro Salud for these two classrooms. We know that CUPS has helped our communities for many years. We want you to always remember that here you planted seeds that will give much fruit for us and for future generations. We hope that you continue to visit us and that you never forget that here you are very much loved." Leslie, a young student at the Petra Valdez Rodriguez Primary School, welcomed Helen Hogg, Spring Branch Presbyterian Church, Houston and Louise Flippin, CUPS' Mission Director as school began on August 23. The Valdez Primary School is located in the south part of Valle Hermoso where there was no primary school until last year. The temporary buildings used for classrooms were in exceedingly bad condition. Principal Angelica Marin said, "Our main goal is to help these children be somebody in life and to value themselves for that they need an education." The CUPS board committed to build two classrooms. 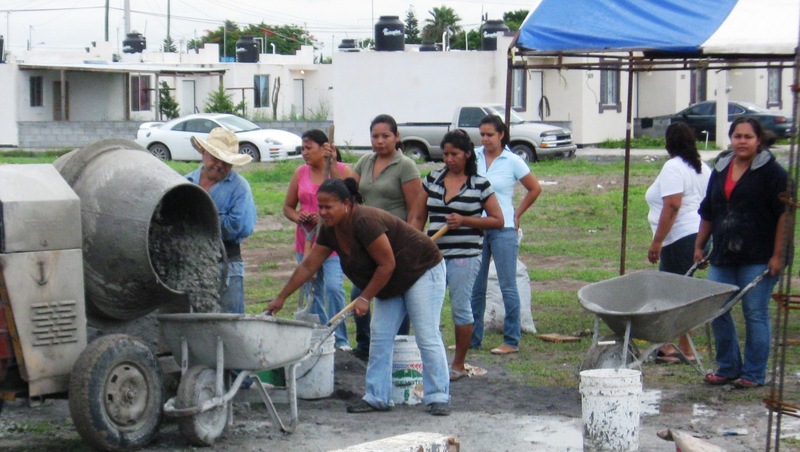 The State of Tamaulipas completed two more classrooms and bathrooms in October. This will provide 4 comfortable classrooms for the 136 students and their five teachers. The Parents' Association helped build their primary school and was very happy when Hope Presbyterian Church, Austin, Texas, joined to help continue the construction. Rainy weather from tropical fronts and Hurricane Alex both challenged and slowed construction progress during the summer. The Parents' Association worked hard to build a school for their children. Hope Presbyterian Church at work. We shared tools, water, shade and smiles with the workers building the state-funded classrooms. Children saw adults working hard to improve the children's educational opportunities and they joined to help. Children, making hard work almost like a game, recharged adult energy levels. At the end of their work week, Hope Presbyterian Church members dedicated the buildings using Mark 10:13-14. "For our students to receive a pencil or a notebook is not only a dream but of much use. The majority of our students come from very low income families, children of divorced parents, single mothers, and others (who) are being raised by their grandparents." The Valdez Primary School was one of 40 schools that received school supplies, books and quilts provided by CUPS volunteers and supporters during the 2009-2010 school year. This is a blessing to both those who receive and those who give. If you want to make a big difference for students, their families and teachers, contact CUPS by clicking on the Contact Us link above. Helen Hogg, Spring Branch Presbyterian Church, gives school supply packets prepared by her church to the first grade students at the Valdez Primary School. Sixty desks and chairs for the new classrooms arrived on the second day of school. Friends from First Presbyterian Church and First United Methodist Church, LaGrange, Texas located, stored, and transported this furniture to Brownsville. Once import permission was received, thanks to help from CUPS' friends Marte Rodriguez and his staff in Matamoros, the furniture donations came via a Rodriguez Hardware Store truck to Valle Hermoso. Saying "This is no longer needed," a teacher tossed out the door a cement block once used as a "chair" for a student. Unloading the donated school furniture with the lots of help. "Thank you, CUPS, and your volunteers for our new classrooms."